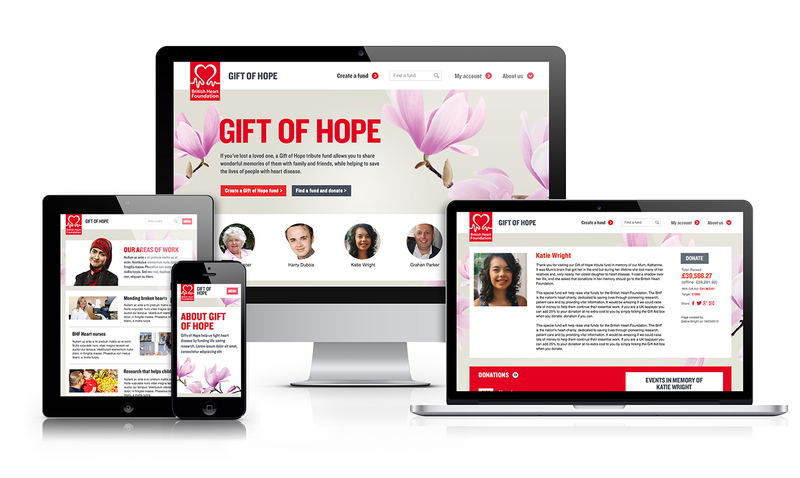 The nation's heart charity worked with digital product studio Addition to redesign and reinvigorate two popular fundraising destinations; updating the visual identity to bring the sites in line with the current brand and emphasising the core message of research. The BHF brand is bold and striking, as befits a charity focused on raising money for life saving research. However, applying this brand to in memoriam and legacy products (whether digital or more traditional) is a balancing act. We were faced with the following challenge: ensuring the core message and values of the charity were communicated consistently but also sensitively to an audience that may have recently lost somebody close to them. Earlier this year, the Addition team (part of WPN Chameleon) relaunched two fundraising sites for British Heart Foundation. Gift of Hope is a tribute platform where people make donations in memory of loved ones, and Give in Celebration allows donors to give money instead of physical gifts for special days, like birthdays, weddings or anniversaries. Offline, the legacy and brand team at the BHF had addressed these concerns, producing thoughtfully designed leaflets and other materials. However, they needed to adapt this material online, while also factoring in the mindset of those landing on the sites. Over the years, we’ve created several tribute fund sites for some of the biggest charities in the country, all of which had the same requirements that needed addressing – so I’d like to think that we’re experts at this! Drawing on this experience and our design expertise, we were able to balance the striking BHF visual style with the need of the in memoriam user. We used the imagery thoughtfully, overlaying the messaging on top – creating a sense of openness and calm that kept the focus of the home page on the user, encouraging them to either set up or find a fund. From the outset we designed and shared with the team at BHF, including the brand team, the key user journeys so that they could better understand how and where the research element – such an important part of the brand – was to be introduced. By recognising the importance of brand and the needs of the in memoriam audience we were able to create an effective and modern design that was well received by both the legacy team and the brand team at the BHF. Since launching in September the creation of new funds has increased by 54% on the previous 2 months; average donations increased by 67% and total donations is up 67%. There has also been a huge increare in the creation of events associated with funds – up 750% on the 2 months prior to launch. Lastly, we have seen a 361% increase in donations being made to in Celebration funds.